Enterprise Database for managing elderly care. a) Agency Hourly services performed by Home Health Aides and registered nurses at patient homes. d) Consumer Directed or Independent Hourly services are provided by individuals who are relatives, friends or neighbors. This program addresses the cost structures variation of these services. It enables a system of management in government payment to the healthcare providers such as vendors, and individuals, who provide the services. The reimbursement of payment to the healthcare providers incorporate the co-payment by the client to the providers is based on clients’ income, age, marital status and healthcare condition according to the current year policy. Respite Care Services program is managed by this advanced client-server software database using front end PCs and backend servers, including remote access VPN services. The Respite Care Service is an established nationwide healthcare infrastructure to deliver care services to the elderly over a decade. This Care Grant Management program provides the essential tool for the healthcare coordinator to manage and provide proactive healthcare intervention and assessment of care to the population. 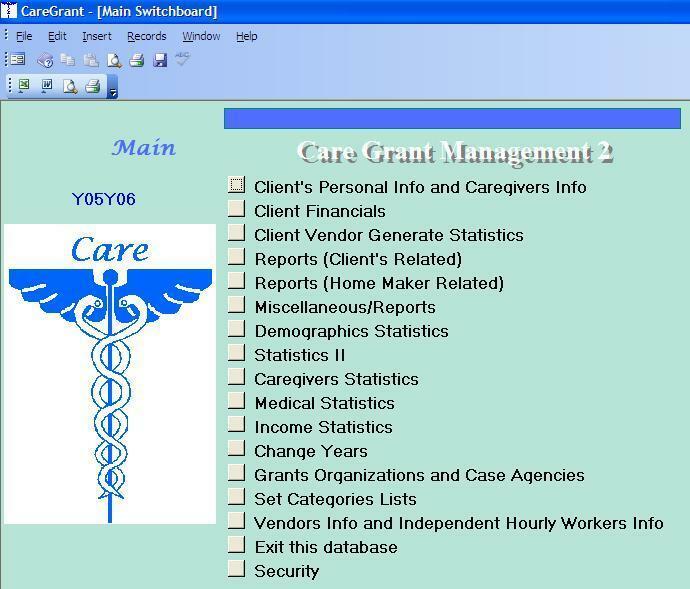 Care Grant program allows registered clients to be authorized on a flexible system based on the coordinator’s evaluation of the client health to allocate healthcare service units. In addition, the program allows the healthcare coordinator to monitor the complex use of these remitted service units on variety of healthcare services performed by the vendors and caregivers, avoiding overcharge or services that are not performed accordingly. Additional funding sources are monitored as independent accounts allowing clients with special requirements such as Alzheimer/Dementia to receive additional service units. Another important feature of this program is that it allows instantaneous compilation of comprehensive statistics to monitor usage, demographic statistics, medical condition statistics, reimbursement statistics, copayment statistics, caregiver statistics, and vendor usage statistics. Actual healthcare expenditure statistics are expressed in terms of service units and dollars. These statistics are vital to the improvement of healthcare policies that are revised yearly to direct the course of healthcare intervention and appropriation of budget.